Arkansas rock crystal cluster has TWO NINE FACED Points - SO rare it's ridiculous, and so under priced for one missing facet already in regrowth! 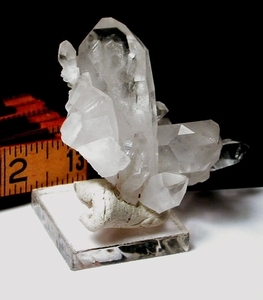 Wonderful spread of crystals 1-1/2x 2-1/4x 1" tall [miniature]. Plate bottom in pointed regrowth with little iron inclusions. Several penetrators to the main crystal, and rainbows, record keepers.